Last weekend I read an interesting little book. 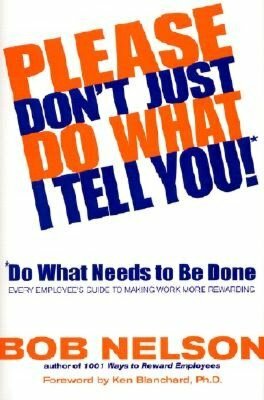 Titled Please Don’t Just Do What I Tell You (by Bob Nelson), this book really struck a chord with me. Early in my blog life, I posted an entry titled What keeps me up at night. It dealt with my rising panic at what I perceive to be a lack of critical thinking in our current society–or at least in the workplace. Admittedly, I faded into the esoteric. I could have communicated my point better. Thankfully, now I don’t have to. Though I never once came across the term critical thinking, this book lays the foundation for exactly that. In simple, practical terms, it encourages people to think ahead, understand motives, take initiative, and get things done. Nelson gives suggestions and lays out real world scenarios that will serve as a terrific pocket primer for some and a reminder for others. Pick it up if you get a chance. At less than 100 pages on my iPad, it was a quick read, but well worth it.